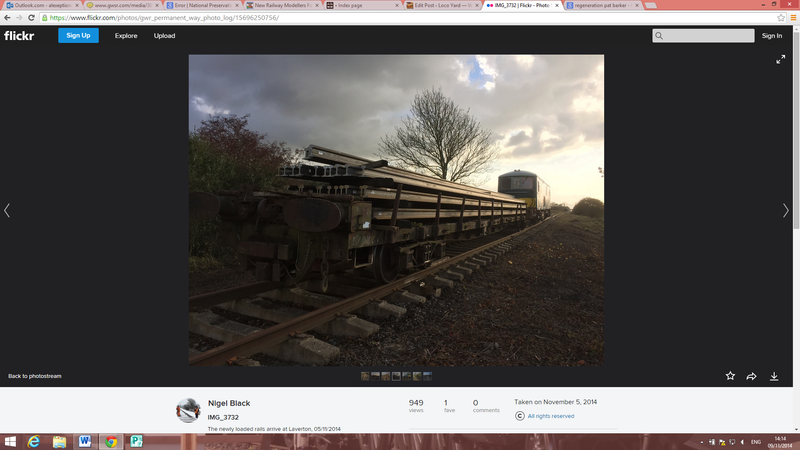 I haven’t written anything about the GWSR’s plans recently, so seeing as lots has been happening on all three main fronts in the last few months I thought an update was due. First of all on the station rebuild which has steadily been progressing, the extended platforms are now nearly finished, and they will be able to accommodate 8 coach trains plus locomotive! It amazed us C+W people who are wondering when our trians are going to be that long. It’s also partly forward planning for when we eventually get to Honeybourne and we have the ability to accept mainline rail-tours, Broadway is a desirable location to visit and as the station is pretty near the place it’s named after (unusual for the GWR – Winchcombe station is actually in the village of Greet). The signal box is really looking impressive now with the locking room windows in and the locking frame certainly imminent, if not fitted now. I saw it at Winchcombe some time ago, I understand it’s been dissembled for transport to Broadway where it will be put back together and fitted. The rest of the station buildings will hopefully be started next year. As you can see in the picture above, Broadway also has it’s first signal bracket, which was installed a few months ago now, and looks splendid. Although not essential to the build order (!) it is a great symbol of progress made, and gives a more impressive too. Finally on the actual station rebuild front., the ex Henley-in-Arden Footbridge saved my Andrew Goodman has arrived on site where it is being restored for eventual use. You can view progress on the Broadway station blog. 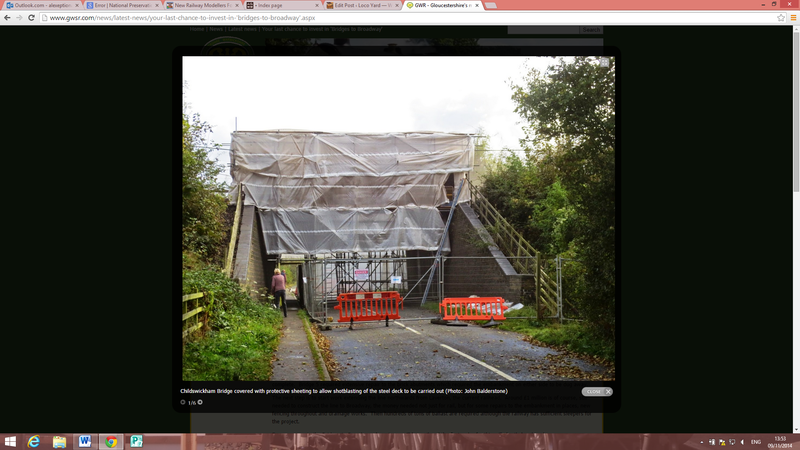 Picture from John Balderstone, bridges to Broadway blog. On the Bridges front the EIS “Bridges to Broadway” share offer closed just a couple of weeks ago raising over £565,000 which is an amazing achievement. Not only does this mean that all the bridge repairs can be paid for including some of the nasty surprises found, but a surplus has been raised for other aspects of the extension to Broadway (see below). Even though the total amount needed has only just been raised, work on the bridges started in June by contractors, with work on three finished and the other two nearing completion. You can find the latest on the bridges blog. Picture from Nigel Black, P’way Flickr site. Finally, the most exciting bit in my opinion, is that with the surplus money raised from the share offer plus some money from the railway’s own coffers now that we are back to making a profit after all the embankment problems 80 60ft brand new lengths of rail have been ordered from Tata steel at Scunthorpe, incidentally, the same company who recently cut the new build P2’s frames. The first half of the order was delivered on the 5th of December and taken straight up to the railhead just beyond Laverton loop and stored there where it will be laid in the Spring once the winter maintenance of the running line has been done by the p’way people and trains have started running again. the second shipment will be arriving in a week or two. This amount of rail will take the permanent way just up to Little Bucklands Bridge recently repaired, equalling about a third of the extension from the current railhead to Broadway, or in other words about 800 metres/half a mile of track. You can view progress on the brand new extension blog or the P’way Flickr site. 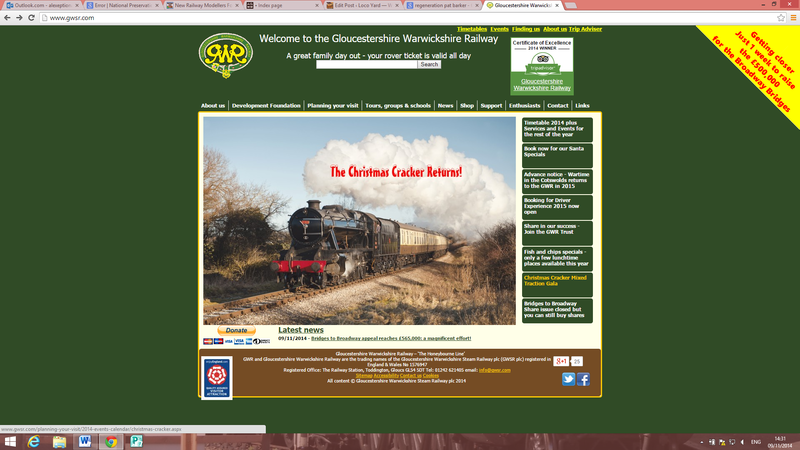 On a related note, the GWSR will be having its now annual Christmas Cracker event on the Monday 29th-Tuesday 30th of December, which will feature two steam locomotives, 3 diesel locomotives plus the DMU, and combinations thereof, so plenty for everyone! Do please come along, it will only bring about the opening of Broadway sooner, as the more money there is available, the quicker rail and materials can be bought for the rest of the extension. I might managed to upload a few pictures of the event, depending on whether I’ll be allowed to escape the festivities for a while!